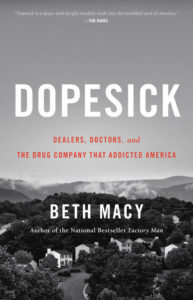 On the Road with Beth & Byron — Notes, Quotes, BookNotes. ANY BOOK MENTIONED 30% OFF for three days only. Grab your favorite fall beverage — pumpkiny spicy stuff is fine, although, as will become evident, a stout Guinness might work, too — and see if you can glean some inspiration from this report of some of our bookselling work this fall. while supplies last, of course. Afterwards these remain on sale at our customary 20% off for BookNotes readers. 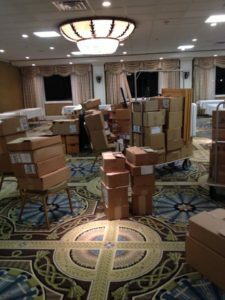 Many who follow our BookNotes newsletter enjoy hearing about some of our escapades on the road when we lug boxes of books and crates of supplies to build shelves and drape upside down cartons and string lights and set up our off-site pop-up book displays. I thought I might dedicate this column to a report from the highways and byways. We want to thank those who trusted us to offer resources at their events. You know who you are, but we thank you for your invitations and support, getting us to play a role in your event, putting me on your stage. It’s been a blast. Except for the all-night set-ups, the sore backs and that time the power went off. Oh, and the beverage spill on those hardbacks, but I digress. Earlier in the fall I enjoyed some speaking engagements, too, including a wonderful trip to the Three Springs Camp site of the spectacular OneLife gap year program. As they think about culturally engaged, Biblically faithful, whole-life discipleship for those transitioning out of high school and into young adulthood (and maybe college) we talked together about vocation and calling, Kingdom and church, the Bible and life, creation and new creation, and life and learning. 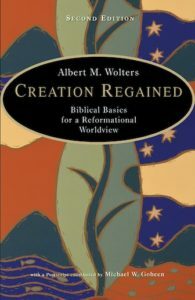 Al Wolter’s Creation Regained: The Biblical Basis for a Reformational Worldview (Eerdmans; $15.00) and OneLife director Derek Melleby’s Learning for the Love of God: A Student’s Guide to Academic Faithfulness (co-authored by Don Optiz) (Baker; $15.00) were books I recommended strongly. And lots of others, too, of course, from Heaven Is Not My Home: Living in the Now of God’s Creation by Paul Marshall to Greg Jao’s booklet Your Minds Mission to Think by John Piper to Garden City by the popular John Mark Comer.) 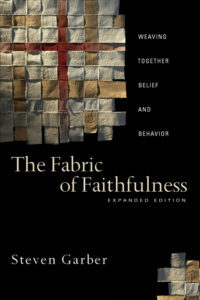 I’m not sure most of these gap year kids considering their futures were quite ready for Steve Garber’s stunningly good Fabric of Faithfulness: Connecting Belief and Behavior (IVP; $19.00) but that book is very much about the young adult years, and informed Derek and his OneLife teams in the good work that they do. Do you know it? You really, really should! More recent publications that I alluded to included The New Copernicans: Millennials and the Survival of the Church by John Seel (Thomas Nelson; $16.99), Ben Sasse’s The Vanishing American Adult: Our Coming-of-Age Crisis and How to Rebuild a Culture of Self Reliance (St. Martins; $17.99) and the serious, brand new The Coddling of the American Mind: How Good Intentions and Bad Ideas Are Setting up a Generation for Failure by Greg Lukianoff and Jonathan Haidt (Penguin Press; $28.00.) Whoa! I doubt if the young students will read them but like Kenda Creasy Dean’s Almost Christian: What the Faith of Our Teenagers Is Telling the American Church (a serious, big-picture must-read for anyone who cares about teen ministry) published by Oxford University Press ($26.95) these are vital, important, even game-changing resources for those working in this particular field of the Lord. Also brand, brand new, is The Passion Generation: The Seemingly Reckless, Definitely Disruptive, But Far From Hopeless Millennials by Grant Skeldon and Ryan Casey Waller (Zondervan; $16.99.) Looks good! I liked Waller’s book Broken which was published a year ago by Forward Movement. These recent works are important volumes for those pondering young adult ministry these days. 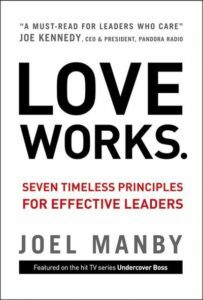 Any campus ministry staff reading along? You should know these books! Another group from OneLife (from their Lancaster site) came to us here at the shop one sunny early October day in two large shifts, and I got speak to them and our staff helped them buy a bunch of books before they made their way back to Lancaster. We felt the energy from that whirlwind day for a week!. We talked one-on-one with more folks earnestly seeking good books in that one day than we do in most weeks! It’s so exciting being with those who realize they’ve got a lot to learn and know that books can impact their lives. Such events and such interest in book advise reminds us why we’re in this business: we really think books can help people live better lives. 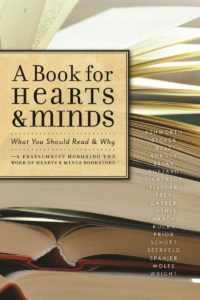 One of my friends who is a consummate book lover and avid reader of fiction and nonfiction is Don Opitz who co-authored the above-mentioned Learning for the Love of God. (If you know any college students who have any inkling of being a Christian in their college years, this would make a wonderful gift! It is actually dedicated to me, so I feel deeply connected to it, and commend it often!) Don graciously asked me to do a couple of chapel talks at Messiah College this fall and it was an honor to do so; I’ve spoken to the study body of other Christian colleges such as Gordon, Eastern, Grove City, Taylor, Geneva, and Montreat, so it was sweet speaking to the entire, large student body in their morning chapel. Later that evening I did a talk about the role of books and reading which was really fun. (Thanks to those students who hopped in a car a week later and visited us here in Dallastown!) And thanks to Don’s team, the worship band, and those who hosted me so well. Messiah is a pretty and hospitable campus. 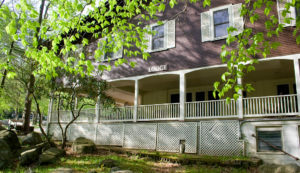 I noted to the audience that years ago I helped name what was once a center for faith and cultural engagement on campus, Issachar’s Loft (which now does excellent work in experimental education, outdoors leadership training and the like.) 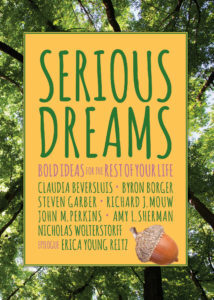 To unpack the Issachar name I said in passing, I’d recommend my chapter in the book which I edited which is full of inspiring and visionary college commencement speeches called Serious Dreams: Bold Ideas for the Rest of Your Life (Square Halo Books; $13.99) where I write about 1 Chronicles 12:32, a verse God gave me in the 1970s about being known as those who “understood the times and knew what God’s people should do.” Oh, if our churches and fellowship groups and institutions of Christian higher education held out the vision of raising up a generation of sons and daughters of Issachar! That Serious Dreams book, by the way, besides my long introduction about the young adult years and discerning one’s vocation in small towns and rural places (not everybody gets the cool corner office in some spiffy high-rise in a world class city, after all) could be inspiring for nearly anyone. I’m proud to have pulled together guidance from the likes of Richard Mouw and Amy Sherman and John Perkins and Steve Garber and more and when I speak on college campuses I sometimes show it off. Anyway, I wish more older folks would read Serious Dreams, too, and think of younger adults they could share it with. If you’ve like anything you’ve heard me say out on the road this fall, chances are it’s clarified and expanded by the sharp authors in Serious Dreams. And, speaking of campus pastor Don Opitz, Beth and I are always grateful for his enthusiasm for serious reading, whether it is fiction or theology, sociology or spirituality, even if he’s not a fan of the Enneagram! He and his wife helped us load up and lug boxes after a Presbytery display out his way that took a lot of time during a discouraging weekend. Their help was a true blessing!) One of the books we sold at that event, by the way, is one that the moderators of the PC(USA)have asked every PC(USA) church to read together, a serious study called Always With Us? 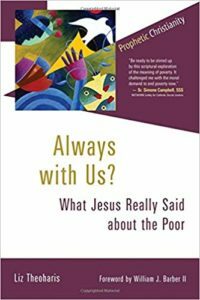 What Jesus Really Said about the Poor by Liz Theoharis (Eerdmans; $25.00.) It’s a bit more demanding, but more overtly Biblical in nature than the previous one our denomination was reading together, the excellent Waking Up White And Finding Myself in the Story of Race by Debby Irving. We’ve been to a few other Presby gigs this fall — just yesterday at the Baltimore Presbytery learning day — and featured this one at each place. We had some after-hours in-store events a month ago, too. I did a workshop with a very impressive group of Pennsylvania-based Southern Baptist campus ministry leaders (Baptist Collegiate Ministry.) Wow, where they an impressive and fun group! I was excited to connect with those who have years (and in some cases decades) of experiencing helping college students find a relationship with God through Christ and helping them connect their discipleship to their life in college. These campus workers – like my pals in the CCO and IVCF and Cru and such – have some “serious dreams” and it was an honor to host them here at Hearts & Minds. As you might guess I announced the book done for Beth and I as a gift honoring our 35th anniversary by the Square Halo Books folks called A Book for Hearts & Minds: What You Should Read and Why: A Festschrift Honoring the Work of Hearts & Minds Bookstore which was compiled and edited by Ned Bustard (Square Halo Books; $18.99.) It is jam-packed with eloquent essays and inspiring pieces by various scholars and writers telling us about the books they most recommend in their fields. There are chapters by N.T. Wright and Calvin Seerveld and Denis Haack and Karen Swallow Prior and lists developed on fantasy and cookbooks and Bible study and films and politics and sociology and the arts and so much more. It’s a good handbook for anybody who loves books and reading about books. I swear, reading these chapters is more valuable for most of us than a year’s worth of The New York Times Review of Books. Naturally, I also plugged a book I adore – Reading for the Common Good: How Books Help Our Churches and Neighborhoods Flourish by C. Christopher Smith (IVP; $16.00.) 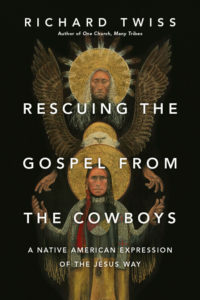 I think I even recommended the exquisite Reading for Preaching: The Preacher in Conversation with Storytellers, Biographers. Poets, and Journalists by Cornelius Plantinga (Eerdmans; $14.00.) What great tools these are to inspire others to become lifelong learners and serious readers. 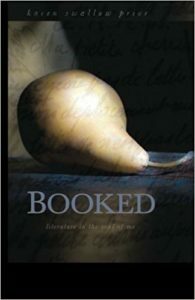 If you read BookNotes regularly you know about the two wonderful author events we held this fall. 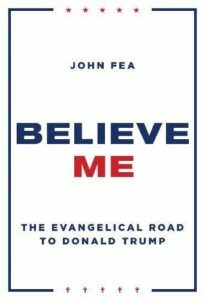 People drove from far and wide to hear nationally-known historian John Fea, lecturing and discussing his important Believe Me: The Evangelical Road to Donald Trump (Eerdmans; $24.99) which is important reading these days. We were beyond comfortable capacity with over 100 guests to hear Dr. Fea and we stayed until after 11:00 talking about faith and politics in the age of Trump even as we drank [or didn’t] Red State and Blue State Kool Aid or Green Party Tea. Ha. A week later folks came out to hear our very smart literary friend, Liberty University literature professor Karen Swallow Prior, speaking on her new book about virtue and reading good books, On Reading Well: Finding the Good Life Through Great Books (Brazos; $19.99.) 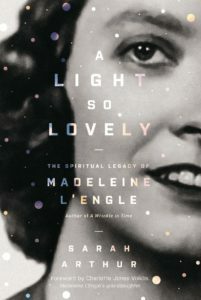 We love her other books, too, including her wonderful, beautiful, Booked: Literature in the Soul of Me (T.S. Poetry Press; $17.99.) We had a good gathering for Karen, too – over 40 interested customers, at least, who loved her bookish knowledge and her bidding to read the good stuff. What good conversations great books evoke! We were very grateful she made the trek from Virginia to be with us. 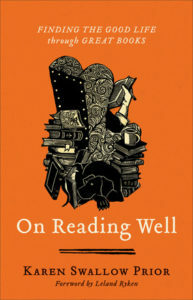 Publisher’s Weekly just named On Reading Well one of the best religious books of the year — congrats to Karen! Thanks to the remarkable Praxis Gathering in Philadelphia for allowing us to bring some books to your impressive event. Click that link and take a look at these speakers, and know that we had all their books there. All but a few of these books we knew, and we were familiar with many of the authors so we really felt like this was our tribe. Kudos to them for having so many women, people of college, young and old, urban and rural, thought leaders and practitioners in the fine art of church planting and advancing a Kingdom movement. It’s very cool to be part of ecumenical events, and this gathering included missional leaders, church planters, and scholars from places as diverse as Missio Alliance, Plough magazine and publishing, and Pittsburgh Theological Seminary. What fun. If this is something you are drawn to, you should plan to attend next year. By the way, we had not heard of Rohadi Nagassar and since his book Thrive. 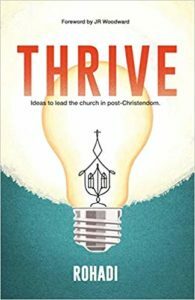 Ideas to Lead the Church in Post-Christendom (Roberry Publishing; $15.99) is self-published, you may not know of it either. 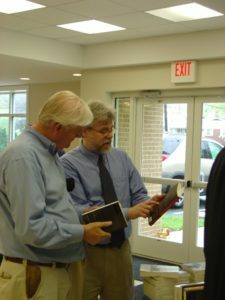 Those who publish on more conventional publishers – InterVaristy Press, Baker Publishing, Eerdmans, Fortress, Zondervan, Crossway, Abingdon, and the like – have a hard enough time getting their work known; self-published books are often only sold by the author at his or her events or out of the trunk of their car so most potential readers never hear of them. 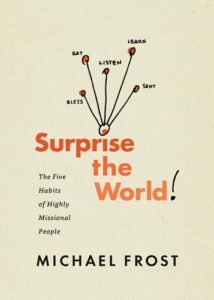 So here’s a good shout-out about a really good book by a fascinating speaker and leader. We’re thrilled to have discovered his book through this event. Why not help a brother out and help get this work better known? Our friend J.R. Woodward (I hope you know his IVP classic, Creating a Missional Culture: Equipping the Church for the Sake of the World ) writes a vibrant foreword. 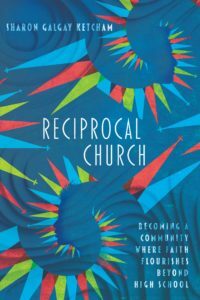 Speaking of books that captured much of the vision and energy of that Praxis Gathering, I’d want to celebrate (as I do many places we go) the extraordinary book by Praxis speaker Christiana Rice (co-authored by Michael Frost) called To Alter Your World: Partnering with God to Rebirth Our Communities (IVP; $17.00.) 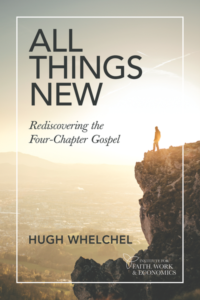 I love that book and suggest it to anyone who wants to exegete your own community, discern what sort of issues need addressing, and how to help birth newness in those places. Very highly recommended! While at the CCBA event I loved finally meeting an old facebook friend whose books I’ve reviewed, John Van Sloten. 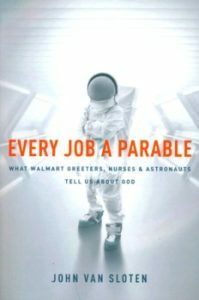 His most recent book is the fabulous Every Job a Parable: What Walmart Greets, Nurses, and Astronauts Tell us About God (Navpress; $14.99.) John gave an incredible presentation on finding God in the work-world, how paying attention to the actual work itself can reveal good stuff about who God is and how God’s world is structured. If “the heavens declare the glory of God” (Psalm 19) and we are to be informed by the creation speaking to us (the fish, even, so says Job 12) a Christian perspective on work must go beyond the great starting point of calling and the obviously important concerns about integrity, business ethics, relationships, and love for others and actually be intentional about considering the literal stuff we work with. God is there, all around everything and being aware of the spirituality of the moment and the revelatory nature of our typical tasks at the job site can be nearly revolutionary. You can learn more about his book Every Job a Parable here. Thanks to everybody out at the CCBA event. If you are anywhere in the Rocky Mountain area, put it on your calendars for next year – we may not be able to take a book display out there, but I’m glad to play a small part. Zooming back from there we packed up two of our larger fall events, our beloved, annual Wee Kirk conference at the lovely Laurelville Mennonite Camp and Retreat Center in Western PA. I like to pronounce Wee Kirk with a Scottish accent, since it is a very Presbyterian (USA, mostly) event and it is all about small church life. What good folks, what thoughtful book buyers, what encouraging Christian leaders who inhabit with confidence (usually) and joy (usually) their rural and small town spaces and represent God’s coming Kingdom in often quiet, smallish ways. We all recalled our aging friend and supporter Eugene Peterson (he had not passed yet) who years ago so encouraged us as a speaker at Wee Kirk (as did the late, great Bible scholar, Ken Bailey.) We’ve had great speakers at Wee Kirk over the years and this year was no different. Jordan Rimmer kicked off the event fabulously as he explained some of the semiotics of story and channeled a bit of his teacher, Leonard Sweet. He invited us to realize the power of story, the storied nature of our lives, the way we live into and tell about God’s story, what we sometimes call the four-chapter story of creation/fall/redemption/restoration. 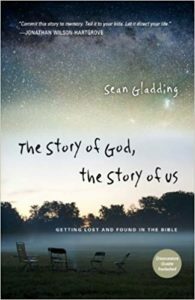 I’m glad he highlighted creative books like The Story of God The Story of Us by Sean Gladding (IVP; $17.00) and The Drama of Scripture: Find-ing Our Place in the Biblical Story by Craig Bartholomew & Michael Goheen (Baker; $24.95) and told folks to start Bible study groups using the great discussion resource All Things New: Rediscovering the Four Chapter Gospel by Hugh Whelchel (Institute for Faith, Work, and Economics; $8.00.) Yes! Jordon is more theologically conservative than either Rob Bell (What Is the Bible?) or Rachel Held Evans (Inspired) or Peter Enns (The Bible Tells Me So) but noted how he enjoyed much of their insights into how the Bible works as a story. 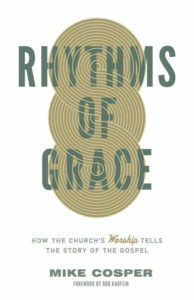 He highlighted a ton of books about story in neuroscience and work and pop culture and advertising, including titles like Mike Cosper’s The Stories We Tell: How TV and Movies Long for and Echo the Truth (Crossway; $15.99) and then Rhythms of Grace: How the Church’s Worship Tells the Story of the Gospel (Crossway; $15.99.) Such good books! Grove City College Bible prof and Presby pastor James Bibza brought a very healthy and classic reminder of the storied nature of the Bible as well – one cannot avoid it – but his talks emphasized the historical reliability of the Bible, helping those of us who teach and preach to be clear about the absolute authority of the Word of God written. He cited heavy-duty scholarship such as The Inerrant Word: Biblical, Historical, Theological, and Pastoral Perspectives edited by John MacArthur (Crossway; $35.00.) 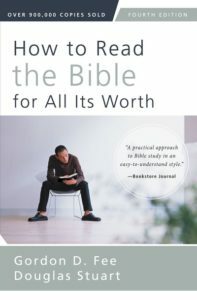 His go-to, entry-level book on how to read the Bible well and faithfully is How To Read the Bible for All It’s Worth by Gordon Fee & Douglas Stewart (Zondervan; $22.99) and it is one of our biggest sellers in this field, so we were glad about that – you should have a few copies of it around to share with anyone who needs some helpful guidance on how to better read the Bible. It is reliable and interesting and very helpful. We loved, as always, being with our friend Lisa Nichols Hickman. She did a stunning closing sermon inspired somewhat by earlier conversations she and I have had about Hillbilly Elegy and rust-belt geography; I had promoted Eliza Griswold’s brilliant, page-turning Amity and Prosperity: One Family and the Fracturing of America to help us understand the confluence of Northern Appalachia and Rust Belt culture that is Western Pennsylvania; Lisa invited us to think about hard times and resurrection in our unique places. 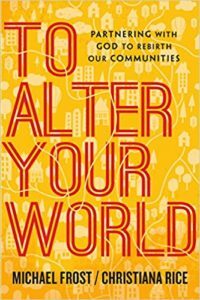 She could do a book about small towns and rust belt places like what Leonce Crump did for caring about urban places in his fabulous Renovate: Changing Who You Are By Loving Where You Are. 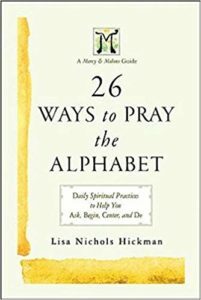 Lisa did three workshops, too, on her lovely book on prayer, 26 Ways to Pray the Alphabet: Daily Spiritual Practices to Help You Ask, Begin, Center, and Do (Abingdon; $6.99) which we like a lot, and the one that I had the great privilege of writing a foreword to called Writing in the Margins: Connecting with God on the Pages of Your Bible (Abingdon Press; $17.99.) She and her husband are ordained PC(USA) ministers and serve Wee Kirk so well. And Beth and I are real fans. There were other workshops, of course, and they gave me lots of time up front telling about books they should be reading. We promoted two great books on rural life — God’s Country: Faith, Hope, and the Future of the Rural Church by Bradly Roth (Herald Press; $16.00) and The Forgotten Church: Why Rural Ministry Matters for Every Church in America by Glenn Daman (Moody Press; $14.99) and two new books on small church life (Small Church Essentials: Field-Tested Principles for Leading a Healthy Congregation… by Karl Vaters (Moody Press; $12.99) and Small Church Checkup by Phil Schroeder & Kay Kotan (Discipleship Resources; $16.00) along with last year’s Wee Kirk best-seller, Love Big Be Well a novel (in a series of letters by a small town pastor) by Winn Collier (Eerdmans; $16.99.) We told about some kids books, some basic spirituality stuff, and some of this years important books for this crew such as Grateful: The Transformative Power of Giving Thanks by Diana Butler Bass (HarperOne; $26.99) and Canoeing the Mountains: Christian Leadership in Uncharted Territory by Tod Bolinger (IVP; $22.00.) 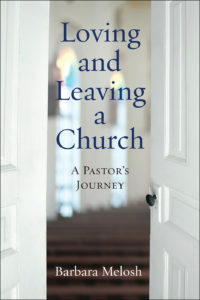 I enjoyed highlighting a beautifully written, very poignant memoir by a pastor called Loving and Leaving a Church: A Pastor’s Journey by Barbara Melosh (WJK; $18.00.) Throughout this several day event over lots of food and among partipants who have become dear friends we had a blessed time chatting and praying and laughing and talking books. CLS has four main ministries – they promote and support legal aid clinics for the poor, they have a broad, general sort of ministry to encourage attorneys in their callings (with chapters all over the country), they do behind the scenes research and scholarship on religious freedom, doing legal work and litigation (including writing amicus briefs that have been cited by the Supreme Court), and they run a fun and effective ministry with law students at law schools all over the country. Their annual conference brings together those serving the poor, those working with prisoners and immigrants, as well as those doing litigation to ensure religious liberty and public pluralism. It takes two wings to fly a plane, some joke, suggesting that there is considerable political diversity in this healthy, important organization. Every profession should have a vibrant, thoughtful, well-staffed organization like this; we are truly honored to have played a small role in their events in recent years. We met a pastor there who we had previously only talked with on the phone and it was so lovely to meet him. His name is Eric Mounts and he told us (so humbly) that he had a few lawyers in his church and he wanted to serve them well and love what they do. So he came to CLS to learn about lawyers – he even goes to the local circuit court to watch appeals, just to study up and learn how better to love the law and serve his parishioners. How about that! 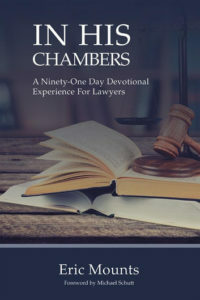 Mounts has written a devotional (which started out, again, for his own lawyer friends) called In His Chambers: A 91-Day Devotional Experience for Lawyers (WestBow; $17.95.) 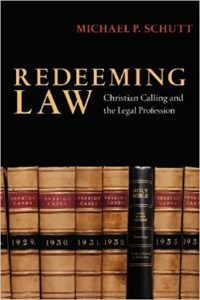 It’s really good (and our friend, CLS staffer and author of Redeeming Law Michael Schutt wrote the forward to it, offering that important imprimatur.) If you know any lawyers it would make a great gift. And – dare I say it without sounding too prideful – you most likely aren’t going to find it at your local religious bookstore or big box chain store. We go out of our way to stock this kind of book, so order some from us today! 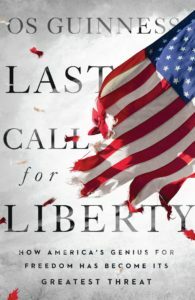 One of our big sellers at the CLS conference was the very new book by Os Guinness called Last Call for Liberty. 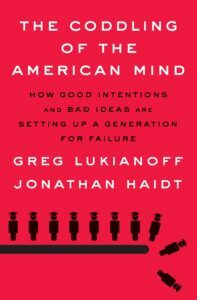 : How America’s Genius for Freedom Has Become Its Greatest Threat (IVP; $27.00.) 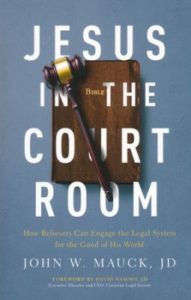 You can imagine that this was a perfect title to promote among these smart lawyers called into the world of law, public advocacy, and civic life, who know much about the pressures of the modern world, including details about legal precedent, constitutional interpretation and the like. Just a few weeks ago, with our CLS conversations still ringing in my ears, I was delighted to connect with Os again after having not crossed paths with him for a few years. I enjoyed, and was challenged, hearing him again (of course) and was jazzed selling his books to a big crowd at Springton Lake Presbyterian Church in Newtown Square, a bit outside of Philadelphia. His concerns about the sustainable future of the American experiment is almost palpable and reading this book carefully could be an important project. Each chapter is essentially a question, a challenging, asking us how we intend to nurture the roots and ideas that sustain our liberty. This is no simplistic screed against Trump or the fake news or whatever other symptom we have of our eroding moral center. Regardless of your own opinions of the issues of the day, this deep dive with challenge and inform you. 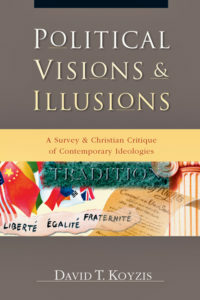 David Koyzis seriously studies this question of the role of the Enlightenment and the French Revolution in our current political lives as profoundly as anyone in his Political Visions and Illusions: A Survey & Christian Critique of Contemporary Ideologies (IVP; $27.00) and if this topic (discerning the spirits and ideologies of old that have influenced our country) I very highly recommend it. But here in Last Call… Guinness brings his trademark passion and clarity to incisively offer a dozen key questions, a checklist, so to speak, for ordinary Americans to do some much-needed civic soul-searching. Which revolution has most decisively shaped us, our views of liberty, and understanding of government, our hopes for our culture? 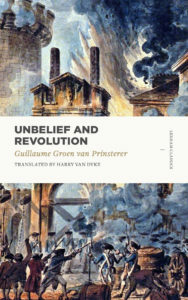 What is it about the autonomous views of law that emerged from the thought-leaders of the French Revolution that have seemed to capture the imagination and worldview of our day? 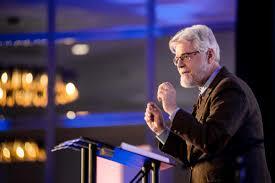 Here is a video of one recent lecture by Dr. Guinness at the Trinity Forum which will give you a sense of his astute insight and compelling lecture style and the urgent content of this new book. Now would be a good time to get that stout that I mentioned… this is a hearty lecture, for sure. By the way, that evening at Springton Lake Mr. Guinness happily shared the stage with one of the most artful, interesting contemporary acoustic rock shows I’ve seen in a while; part worship, part avant-garde folk pop, Young Oceans moved us deeply. 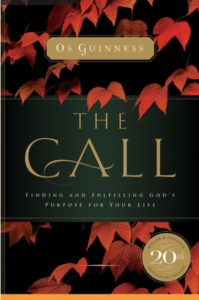 The title of their new album is swiped from a line from Guinness’s classic The Call: Finding and Fulfilling God’s Purpose for Your Life (Thomas Nelson; $16.99) which I often say is one of my favorite books to recommend. Well, the Guiness event came after we flew back to Pittsburgh after the CLS Florida event. The previous week we had flown back from CLS, picked up the Wee Kirk van from near the Pittsburgh airport, driving home in the middle of the night for five hours across the Pennsylvania Turnpike. We felt a deep satisfaction, if bone-weary exhaustion, humming “Rivers and Roads” by The Head and the Heart and, yes, “Homeward Bound” by Paul Simon. What a set of journeys we had; we had so many good conversations with so many different sorts of folks, book-lovers all. A tree had blown down in our yard and even though we are grateful nobody was hurt, it’s a big mess; thank goodness our son is handy with his chain-saw. I had to give a talk the day after we got back to a very sharp group of international mission leaders at a nearby church which I did all hopped up on caffeine and enthusiasm about our book selling road trips, reminding folks once again why these blocks of paper and print are transforming tools that can change the world. We’ve staked our lives on it, and trust that you believe this too. The CLS truck was driven back from Florida and we picked it up and unloaded the dozens and dozens of boxes. Some of those boxes are still underfoot. A week after that we headed back across the turnpike again to a two and a half day event serving the staff of the CCO (the Coalition for Christian Outreach) at their fall training event held at Antiochian Village, an Orthodox retreat center in the lovely hills outside of Ligonier, PA. We arrive there about 11 pm and set up a hefty display until about 7 am. Talking about books to these several hundred campus workers is about my favorite thing to do in the whole world. The joy of the Lord combined with adrenaline and coffee is my strength during those times, but when we get back with another van load of boxes to haul in and eventually unpack, I can be a bit discouraged. At all of these events, we sell great titles, are surprised by what interests people, delighted that people still shell out hard-earned cash for books. Yet, we are sad that we don’t sell more — there are so many good ones and time rarely permits us to show the right ones to the right people. There’s so many titles yet to announce, good folks who need certain titles, resources that can help, we’re sure. If only we could connect better. On good days we sigh; other days I break down and weep. 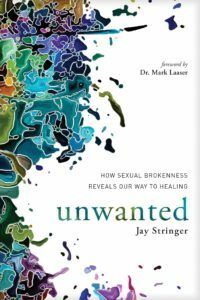 Unwanted: How Sexual Brokenness Reveals Our Way to Healing Jay Stringer (NavPress) $16.99 I’ve raved about this before, an honest look at unwanted sexual behaviors and how we need to face our lusts, diving deeper into what drives us to do what we do. Highly recommended. 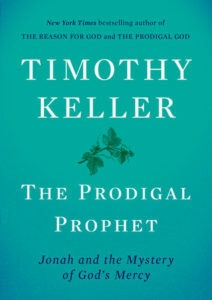 The Prodigal Prophet: Jonah and the Mystery of God’s Mercy Timothy Keller (Viking) $20.00 This had just come out and CCO folks are appreciative of Keller’s culturally-engaged vision, how he weaves a gospel-centered message even into studies like this, showing how the story of Jonah has relevance to our contemporary issues of race, immigration, urban ministry. This is a great little book. 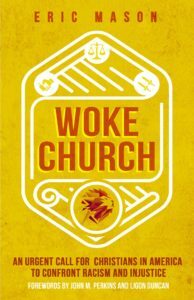 Woke Church: An Urgent Call for Christians in America to Confront Racism and Injustice Eric Mason (Moody Press) $14.99 Again, CCO staff know Reverend Mason and his powerful inner city work at Epiphany Church in Philly — he has spoken at our Jubilee conference several times. It is very helpful for a passionately evangelical, theologically conservative, black pastor to teach us about what a faithful sort of being woke might look like. We sold out of this at CCO staff training, and we hope you order it from us, too. 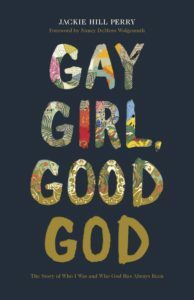 Gay Girl, Good God: The Story of Who I Was, and Who God Has Always Been Jackie Hill Perry (B+H Books) $16.99 Jackie Hill Perry was one of the Bible teachers at Jubilee last year and she was very impressive… Here she tells her life story, including stuff about her conversion, changing her mind about being lesbian, and adopting a Reformed theological orientation and she sets out to tackle issues of social justice. She’s a serious and thoughtful young black woman and a voice many great appreciate for her candor and grace. Keep an eye on her! 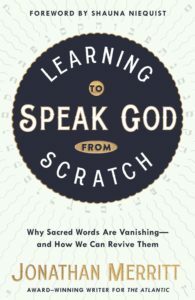 Learning to Speak God from Scratch: Why Sacred Words Are Vanishing–And How We Can Revive Them Jonathan Merritt (Convergent) $15.99 I’ve reviewed this previously and enjoyed Jonathan’s good writing and interesting thinking as he reminds us that words, especially religious/sacred/theological words are often not understood by our 21st century, post-Christian culture. Actually, some people do have some resonance with certain sacred language but because some terms have been weaponized and abused, we simply have to find better ways to say what needs to get said to share God’s grace with others. I will be very eager to hear what the astute, mostly young, CCO staff think of this and how it is useful in their evangelism and disciple-making work on secular campuses. 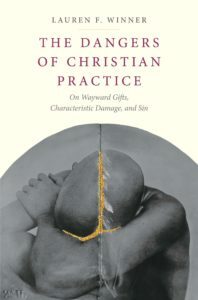 The Dangers of Christian Practice: On Wayward Gifts, Characteristic Damage, and Sin Lauren Winner (Yale University Press) $28.00 This is surely one of the most interesting, semi-scholarly books I’ve read this year (although I am not yet finished with it.) 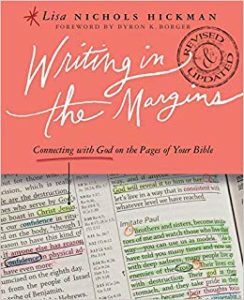 Many CCO staff have read the best book on sin I know about — Cornelius Plantinga’s must-read Not The Way It’s Supposed To Be: A Breviary of Sin (Eerdmans; $22.00) — and this new book by Winner may be mining a similar vein. This is a healthy, helpful, studious exploration of one aspect of the fallen world in which we live, namely, that even good Christian practices — spiritual disciplines, celebrating Eucharist, and the like — are themselves damaged and can be damaging. Our friend Al Wolter’s in Creation Regained has a chapter called “structure and direction” that offers a template for discerning the essentially good thing in God’s creation and how it can be unfolded and practices wrongly, with distortion and harm. Winner gets this with astute insight, that there is characteristic ways hurt happens, even with the good stuff and good intentions. This is a very important. book. 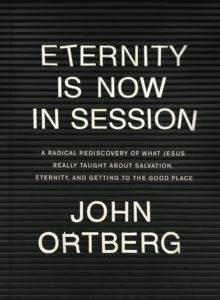 Eternity is Now in Session: A Radical Rediscovery of What Jesus Really Taught about Salvation, Eternity, and Getting to the Good Place John Ortberg (Tyndale) $17.99 I’m glad I told you about this a few weeks ago, and I touted it at CCO. This is N.T. 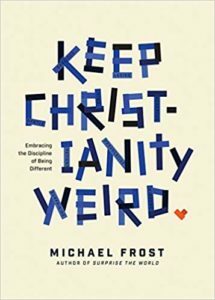 Wright and Dallas Willard re-articulated in Ortberg’s clear, upbeat, interesting way. A tremendous book and what an important truth to get deep in our bones — heaven is breaking into human history in the Kingdom of God and Christ’s reign and presences changes everything. Nice. Check out the DVD, too. 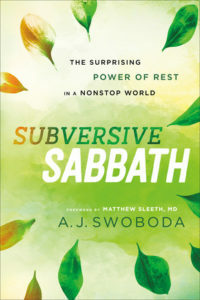 Subversive Sabbath: The Surprising Power of Rest in a Nonstop World A.J. Swoboda (Brazos) $19.99 We had a big stack of these alongside maybe 10 others on this topic at CCO staff training — I think it is the best recent book on Sabbath and one we’ve promoted anywhere we can. Happily, somebody in CCO had gotten it from us before and was telling friends about it so we sold a few. It. Is. Life-changing. It’s big and meaty and full of insight and a great book to work through slowly, even if it takes a long time. We really like this author and this is extraordinary. Very highly recommended! 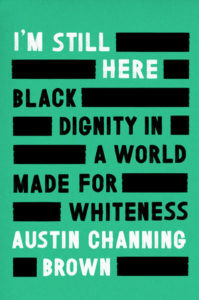 I’m Still Here: Black Dignity in a World Made for Whiteness Austin Channing Brown (Convergent) $25.00 We are proud to have been an early proponent of this extraordinary book, a memoir of a passionate, honest black woman making her way in the world these days. We sold quite a few to CCO friends last summer when we were together and they were back for more at this event. If you haven’t read it, you should; the writing is good and her story compelling. 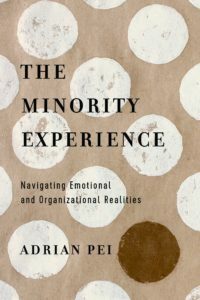 By the way, for those who have looked through this window of how a black Christian relates to her world and the largely white culture and want a bit more, we highly commend The Minority Experience: Navigating Emotional and Organizational Realities by Adrian Pei (IVP; $17.00.) It really is the next thing to read in this topic. Pei, an Asian-American, tells of his own experiences, but expertly adds the findings of research of the social sciences. Pei is an organizational consultant and here describes “key challenges ethnic minorities face in majority culture organizations, unpacking the historical forces at play and what both minority and majority cultures need to know in order to work together fruitfully.” Kudos to IVP for doing this kind of important, helpful publishing. We really appreciate the work of this network that started to resource local parish nurses (we’ve got a goodly selection of books for congregationally-based health-care workers and those interested in parish nursing.) In recent years they’ve been organized through Eastern Mennonite University (who has a Lancaster campus, now.) This year they wanted to explore topics of trauma and shame and they picked an excellent speaker, a respected writer and Christian friend who a practicing psychiatrist. Beth took pages of notes and we’re still talking about neuroplasticity and how knowing a bit about neurology and brain studies can help in our faith development. We sold just these two books at their recent event and we couldn’t have been happier to connect with Curt again. 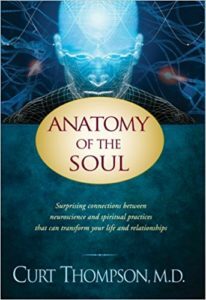 Anatomy of the Soul: Surprising Connections Between Neuroscience and Spiritual Practices That Can Transform Your Life and Relationships Curt Thompson (Tyndale) $15.99 This is an amazingly practical book about relationships and spirituality, informed by neuroscience and the authors deeply integrated Christian view of psychiatry. It’s a great read and good for anyone who just wants to improve their life situation a bit or deepen their understanding of God’s guidance in their life. Very nicely done. 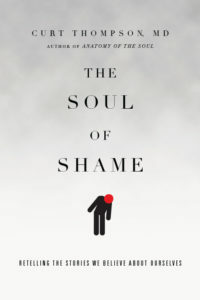 The Soul of Shame: Retelling the Stories We Believe about Ourselves Curt Thompson (IVP) $24.00 This has won any number of awards (including an appearance on our Hearts & Minds Books list in 2015.) It explores shame through the big picture of Scripture’s unfolding drama and then, in light of this frame, teaches how the brain deals with trauma and stress and shame and guilt and how God’s redemptive story can bring healing and wholeness. 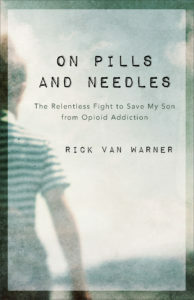 It is one of the best books on the topic I’ve read and we highly recommend it. Maybe you saw a quick photo we sent out on social media showing the long line of books displayed at our gig hosted by our friends at Central Presbyterian in Towson, Maryland. We so respect them and it was a delight to be there again, this time, with the broader connectional church of the area PC(USA.) I got to do a workshop — yep, on reading and nurturing the Christian mind, being lifelong learners as we step into our callings and vocations. What a joy. We displayed books, as we usually do, connected to the various workshops presented. Oh how I wish I could have snuck into each and every break out session to tell them the good books we had related to their topic. 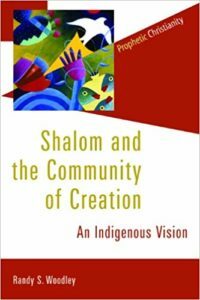 I wish I could have talked to folks about Randy Woodley and his very weighty Shalom and the Community of Creation: An Indigenous Vision (Eerdmans; $25.00) and the fascinating book published by the Mennonite publishing house, Herald Press, Buffalo Shout, Salmon Cry: Conversations on Creation, Land Justice, and Life Together edited by Steve Heinrichs (Herald Press; $24.99.) Wow. 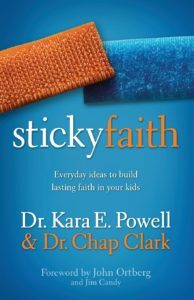 One of the books that was recommended, among many, at this workshop was one that is a fine collection of spiritual practices and good ideas for thoughtful Christian families. 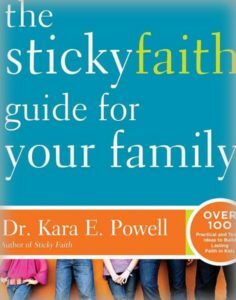 Written out of the context of a mainline denominational church by Traci Smith, this pastor, a Princeton grad, sees these good ideas bearing fruit in ordinary church families. 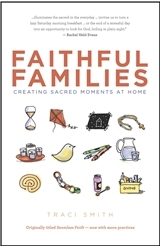 We really liked her earlier edition (Seamless Faith: Simple Practices for Daily Family Life) and appreciate the expanded version now called Faithful Families: Creating Sacred Moments at Home (Chalice Press; $21.99.) What a joy to get to sell these kinds of books to those who care about faith formation in the home. What fun telling people about Steve Garber’s Vision of Vocation: Common Grace for the Common Good (IVP; $17.99) and Jamie Smith and Tish Warren and Eugene Peterson and Os Guinness and Ruth Haley Barton and other favorites that we lug around everywhere we go. And, we loved sharing a whole bunch of kids books. We’ll tell you about some of those before long. What a job we’ve got. Even writing it here is a good reminder to us. Thanks for caring –we hope you find it helpful. We hope you are reminded of resources you may need. For now, perhaps this list will allow you to imagine yourself shopping with us out on the road. 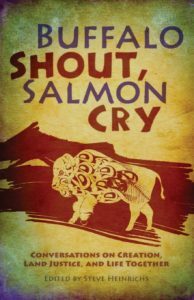 Maybe you are a BookNotes reader we met at some of these (or other) events. We trust you’ll find something helpful here and maybe some ideas for gift giving or your next book club read. Why not help us with our huge unpacking process as we recover from this busy season of being on the road and send us an order today? Don’t forget: any book mentioned, while supplies last, offered at 30% off until end of day Thursday, November 15, 2018. No foolin. This offer expires in less than 3 days. After that the discount remains at 20% off the prices shown.